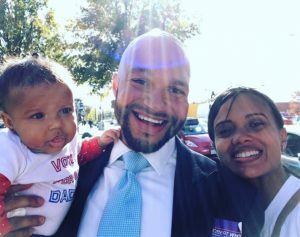 At the end of 2013, I left my job with Congresswoman Eleanor Holmes Norton to run for a seat on the Council of the District of Columbia because I believed I could be a strong voice for the thousands of residents who have called the District of Columbia home for generations, as well as for new residents who have come to the District seeking opportunity. Raised in a family that has struggled in our city, I saw every day the dire need of those who cannot seem to tap into the District’s vibrant and changing economy and I wanted to do something about it. I lost that first race, but I got back up and ran one more time with a campaign headquartered in the basement of my home while my wife, Christy, and I were preparing for the birth of our first child, Madison. During my campaign, I spoke constantly about my desire to be a bridge for those being left behind by focusing on the foundations of economic progress: education, affordable housing, and jobs. I also committed to helping returning citizens after I experienced the frustrations that so many other residents have faced when my brother, Michael, returned from prison. I promised that I would make a positive difference on these issues, and I am a strong believer that good policy can change lives for the better. That is why, within 48 hours of winning my election, I began putting together a Transition Committee to explore policy proposals in my priority areas. The Transition Committee members I selected include people with a variety of viewpoints. Some of them spend countless hours advocating inside the John A. Wilson Building. Others were lesser known stakeholders who brought fresh perspectives to these discussions. I created four subcommittees: Education, Affordable Housing, Workforce Development, and Returning Citizens. I asked each of them to combine the ideas I had discussed on the campaign trail with their own ideas to help me develop priorities for my first term in office. I also asked the Council Members who chaired the committees overseeing these issues to serve as honorary co-chairs to ensure that the hard work of the Transition Committee would not be politicized and would reflect my desire to collaborate with my Council colleagues. I am excited about the ideas that my Transition Committee developed and have studied them for weeks. Using that work as a starting point, I developed this report to summarize the reforms I intend to pursue during my first term in office. I am publishing these goals to promote accountability and transparency. I owe a tremendous debt of thanks to my Transition Committee chairs, Stephanie Liotta Atkinson and Ed Lazere, and subcommittee chairs and members (listed on page 2) who spent many hours researching, debating and meeting as volunteers committed to improving our city. I also thank my Special Advisor to the Transition Committee Janene Jackson, Chief of Staff Mtokufa Ngwenya, Legislative Director Shawn Hilgendorf, Legislative Counsel Breanna Bledsoe, and Communications Specialist Daniel Wise for their work with the Transition Committee and independent research and strategic planning. Fellow Washingtonians, thank you for giving me the opportunity to serve. Much of the economic inequality in our city today results from the educational inequity that has plagued our city for decades. The private development market in the District is not producing the type of housing needed to meet our city’s changing demands. We can do more to bridge the gap between those who are benefiting from the economic resurgence and those who are being left behind. We must be more proactive in reaching out to returning citizens before they make it home to offer the critical supports these residents need.